Patrick Lee Fiction Blog: Congratulations Steve Ulfelder! Among the many great things about publishing, there's the fact that you sometimes get an early look at a very cool novel. 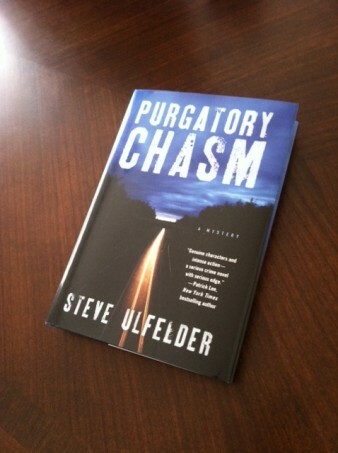 Case in point: Steve Ulfelder's debut, Purgatory Chasm, hitting the stands tomorrow. I think this guy is going to be around for a while. Heard about this via your blog post, bought it on Kindle after trying the sample, really enjoyed the book. Thanks for the recommendation--and looking forward to another from you, hopefully soon! Bought Breach and Ghost Country at the same time because of the James Rollins endorsement. This was two days ago, and I've finished both books - couldn't put them down. Please tell me there's another book in the works for this series!! Hi Marilyn, sorry it's taken me a few days to answer this question. There's definitely a third book on the way--well, I guess by the time you're seeing this, you've already seen the new post about it at the top of the blog. Thanks for reading the books! I was browsing used books at a local Bookman's and on the excellent reads stand was a copy of The Breach with the cover facing out. The cover caught my attention so I read the back of the book and was fascinated by the concept you have created. Well, I have now read both books and am really looking forward to the third. I specifically came to your website hoping there would be a third ready for the presses. I enjoy your writing style and the characters you have created. Can you please write the third book faster?? December seems like such a long time.. Thank you for the hours of enjoyable reading and relaxtion. Loved the first two books when can i preorder the third book? I think Deep Sky can be pre-ordered on Amazon now. Probably on other sites, too, but I'm not sure. Thanks for reading the books!